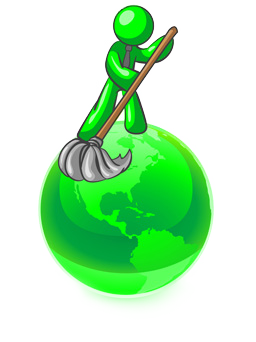 Green Cleaning - Professional Building Services, Inc.
Professional Building Services, Inc. completed our environmental standards for cleaning services in 2002. These standards outline the features involved in our green cleaning practices, such as the use of chemicals, supplies, equipment, training, and communications. We have instituted a “Green Cleaning Policy & Operating Procedures” guideline that we monitor and assess on a constant basis. By green cleaning, we mean “sustainable cleaning.” Sustainability involves meeting the needs of the present without compromising the ability of future generations to meet their own needs. Green cleaning employs the use of eco-friendly chemicals and uses appropriate procedures in their application to ensure safety, minimal environmental exposure, and material efficiency. The intent of our program is to meet the needs and requirements of our clients while reducing the exposure of their personnel and building occupants to potentially hazardous products, equipment, or procedures which could adversely affect human health and the environment both indoors and outdoors. Our green cleaning program was developed and designed to assist in pursuing LEED-EB O&M certification and to help create a more sustainable environment. We have incorporated criteria and practices from USGBC LEED-EB O&M 2009 Version 3, Green Seal GS 42 standard for cleaning services, the IFMA Foundation’s “The Business of Green Cleaning,” and from the “Pennsylvania Green Building Maintenance Manual” to develop the PBS green cleaning program. Professional Building Service, Inc. is a member of the Delaware Valley Green Building Council. We strongly believe it is our responsibility to do our part to preserve the environment.